What is the role of art in times of crises? Are artists mere bystanders or must they actively participate in society? And if so: how? At the Pim de Kuijer Lecture 2019, the world famous Syrian composer and clarinet player Kinan Azmeh will take you along on a musical journey of discovery to find the answers. He will play his own compositions and tell his journey - from a little boy born in a musical family in Damascus, to a Grammy award winning clarinet player, living and working in New York, but who is mainly on tour - from Buenos Aires to Berlin. The Syrian civil uprising in 2011 was a turning point in his life. Through the years, his music became a home to overcome conflict and cultural differences in collaboration with others. He developed his own unique style, a melting pot of different cultures and genres - from classical music to jazz and world music, and reflected in the many cross cultural ensembles he performs with, like Yo-Yo Ma's Silk Road Ensemble. 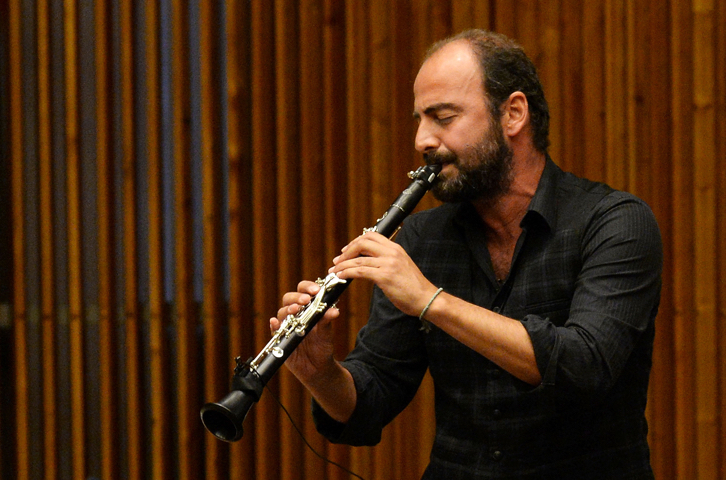 Kinan Azmeh is one of the leading contemporary composers and clarinet players. He was praised in international press outlets as “virtuoso” and “intensely soulful” (The New York Times), “spellbinding" and “brilliant” (the New Yorker) and with an "incredibly rich sound" (CBC). He has played in the Netherlands several times over the last few years. In 2016 he was a guest at the TV-programme Podium Witteman. And early 2018 he toured the Netherlands with trumpet player Eric Vloeimans and pianist Jeroen van Vliet as the ‘Levanter’ –ensemble, the name of a warm, strong Eastern wind. He makes jazz infused with Arabic influences with his City Band Quartet and performs on stage throughout the world - from Carnegie Hall in New York to the Damascus Opera House in his mother country Syria. Together with other Syrian musicians, Azmeh founded the Hewar (“dialogue”) ensemble to, in his own words: “transcend the barriers of musical disparities and misconceptions”. From 2015 onwards, the Pim de Kuijer Lecture annually promotes someone who wants to change the world and who's actions show that it is possible to bring into practice big themes like human rights and democratisation at a young age. The lecture is named after Pim de Kuijer, a 32-year old Dutchman who passed away on July 17th, 2014, on board of flight MH17. Pim was an active member of the social-liberal political party D66 and worked as a lobbyist for StopAidsNow! Before that, he worked in the European Parliament and as a diplomat to the UN in Malaysia. He observed elections in Sierra Leone, Egypt and Ukraine.